This piece was originally published as a review on Game Boyz on 2/13/15. Each Game Boyz review is structured with sections for introduction, graphics, sound, gameplay, and conclusions. Peggle Blast for iOS is the latest game in the Peggle series by Popcap, now owned by EA. Peggle was a minor addition to the Orange Box that ended up being a pretty big deal to me. The mechanics were simple, but it was so addicting and fun! I went on to play Peggle DS, which contained Peggle and Peggle Nights. There was even an addon to play Peggle within World of Warcraft. I skipped Peggle 2 because it wasn’t released on mobile platforms, but I was ready for more. I purchased the iOS port of the original Peggle as soon as it was released. I paid a flat price, and I received a game that I could play. It was a good deal. Peggle Blast, on the other hand, is completely free! Good deal? No, pretty bad deal actually. While I’d be more than happy to pay for a new Peggle, Peggle Blast does the typical microtransaction mechanics of having time-locked aspects that can be unlocked immediately for real money. You can buy power-ups for real money too, and it certainly feels like the game pushes you to use them. But I’ll get into that shortly. The graphics and sound haven’t really been improved in Peggle Blast, but the series didn’t need improvement in this regard. Colors are bright, the Peggle Masters are cartoony, and the music supports the graphic style in its cheery way. It’s just fine in presentation. Let’s start with the good, shall we? At it’s core, the gameplay is much the same as previous Peggle incarnations, and that’s a good thing. Line up shots, watch the ball bounce around pachinko-style, and use power-ups. Not everything is the same old same old though. There are some new mechanics that are quite fun and add some new, interesting challenges to the game. One I particularly like is sludge-covered pegs. These halt the ball’s momentum. That can be bad if you don’t want your ball to stop, but it can also be used to control your shots. Another feature are eggs; some levels task you with breaking eggs open by hitting them multiple times. If the egg falls off the bottom of the screen before you break it open, you lose, but if it falls into the bucket, it’s saved. There are also levels in which you need to collect gems. These objectives add new life to the series. They’re a welcome addition and quite fun. Unfortunately, everything’s not great with the new Peggle. First, there are now lives, and I don’t mean the multiple balls you get per level. Each time you lose a level, you lose a life. Lives recharge, but if you run out of them, you can’t play until at least one recharges – or you purchase more. This can be pretty annoying, because it means that while I might be in the mood to play more Peggle Blast, I have to wait. On the other hand, I’m the type of person that always has a lot to do. I don’t really find myself bored, so it’s pretty easy for me to switch to another task. Sadly, it gets worse. You have to wait for lives to charge, but you also have to wait hours to unlock a world after you complete the levels leading up to it. At least with lives you’re forced to wait only when you run out of lives by losing. 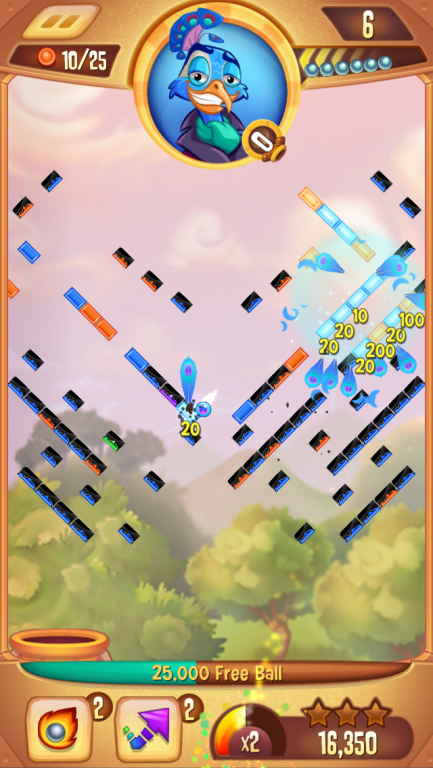 By gating additional levels behind a time delay, Peggle Blast is punishing the player for completing levels. Again, you can pay money to skip the wait. 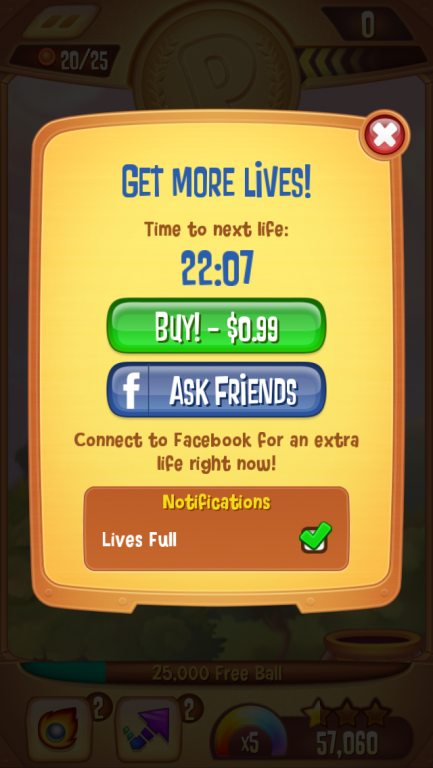 Peggle Blast prompts you to spam your friends too, but I avoided that. There’s still one more problem though. You can purchase power-ups. Anyone familiar with the phrase “pay to win” probably understands the problem here. 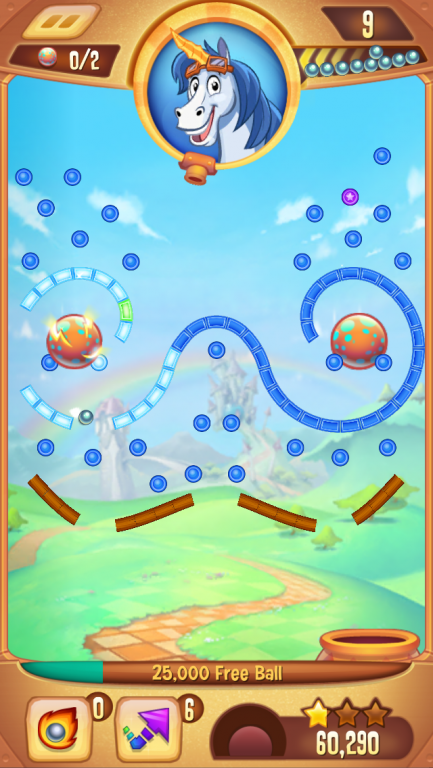 Peggle Blast is designed with being able to purchase power-ups in mind. The levels get insanely hard, and the difficulty in many later levels depend more on chance than skill. Peggle Blast is significantly more difficult than previous iterations of Peggle, and I have a feeling it’s because EA wants us spending money to overcome those challenges. One new mechanic I didn’t mention earlier were bombs. They need to be hit in a certain number of turns or the explode, causing you to lose unless you purchase additional time. And how about boss battles, in which you must score more points than the Peggle Master competing against you? It doesn’t sound too bad except for the fact that they’re basically multiple stages in one. If you lose on the final stage, you’ve lost the whole level and have to start again (or you have to pay for additional balls). I was willing to watch video advertisements for power-ups, but I refused to spend any money on the game. That’s unfortunate for EA, because if the game didn’t have any pay to win features but simply had a static cost, I would have gladly purchased it. Yes, I had to let my lives recharge, and yes, I had to stop playing for hours (eight, I believe) each time I got to a new world. Some levels I played over and over, waiting for the lucky shot that would let me win. It took me a long time and many attempts, but I finally beat the last level. Well, let me save you some trouble: you don’t get anything for beating the game. I don’t mean no credits, and I don’t mean no cutscene. I mean nothing. After beating the final level, I was shown the level select screen. It didn’t even indicate that the last level was completed. Thinking it was a bug, I even beat it a second time. Nope, nothing registers. Thanks a lot. EA has taken a great franchise and buried it in unfair difficulty to push microtransactions. 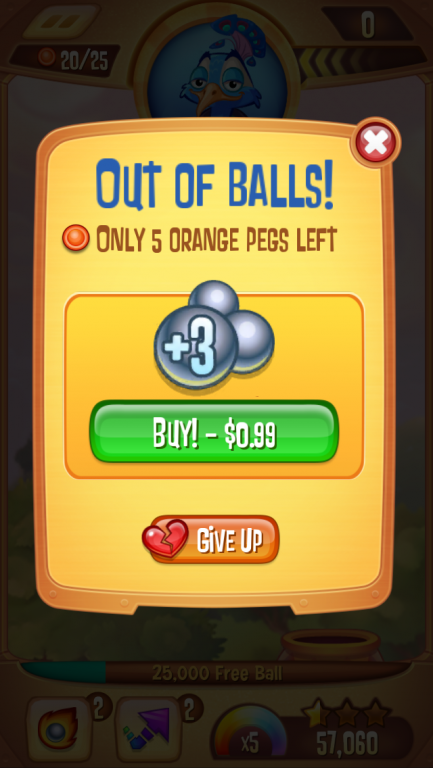 It’s sad, considering Peggle Blast introduced new, enjoyable mechanics. To be fair, I did have some fun with it. I didn’t beat it for review purposes; I beat it because I enjoyed playing it. However, I put up with a lot to get that little bit of enjoyment out of it. I can’t recommend Peggle Blast, and it seriously hurt Popcap’s reputation with me. I am MrDevee on Apple’s Game Center and @TheUser on Twitter. This piece was originally published as a review on Game Boyz on 5/31/11. Each Game Boyz review is structured with sections for introduction, graphics, sound, gameplay, and conclusions. 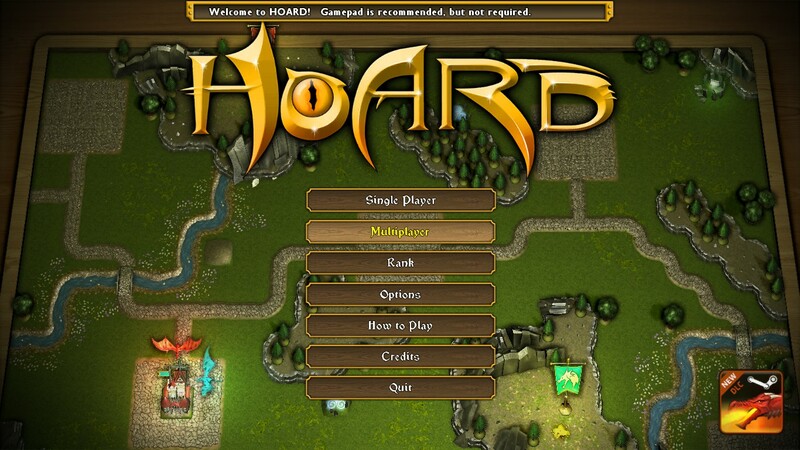 Hoard was reviewed using two downloaded copied provided by Big Sandwich Games. The game got little-to-no attention but was quite fun! Big Sandwich Games recently provided me with two copies of their awesome new game, Hoard. To understand Hoard, I’d like to consider an RTS game. Villages grow and become cities while farms increase in size to feed the villagers. Carts of gold travel along the roads. Castles rise, training knights to eliminate the dragons the terrorize the country. Now consider controlling the dragon. Hoard features a colorful, fantasy look. Maps look like they are placed on a wooden table. This drives a feeling of fun over realism. Multiple tilesets are included, giving you the ability to change the feel of the maps. The world is sparse and simple. 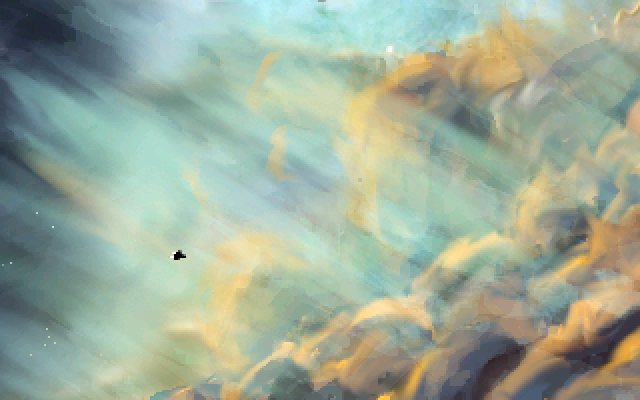 While this makes the background a bit too plain, it makes aspects of the world you can engage really pop. While the graphics won’t win any awards, they set the tone and mood of the game well. Your health and carrying capacity, two very important statistics, are prominently displayed over and under your dragon. This allows them to be seen easily at all times. Your fire-breath on the other hand, which is also an important statistic, is displayed at the top of the screen along with your dragon’s color and score. Because it’s out of the way, it’s hard to keep in mind. Of the three, it’s the least important to see at a glance, so I understand the decision, but I wish I could see it more easily. Keeping it out of the way, however, also keeps the interface uncluttered so you can keep a good view on the game. The music and sound effects work very well in Hoard to set the mood. The music is simple yet exciting, giving that extra drive in competitive matches. The cheerful, light-hearted sound effects contrasts with the music wonderfully, reinforcing that the game is about fun even when you’re trying hard to win. I especially love it when the princesses call for help or cry out. It really adds that goofiness into the game. The goal in Hoard is simple – collect the largest amount of gold to win. The primary way to gain goal is to burn villages, farms, and gold carts and carry the gold back to your hoard. There is some strategy to this though. Letting towns and farms grow bigger will yield larger hauls. Do you want to destroy the towns quickly to maximize your gold early in a match, or do you want to let the towns grow a little, giving you more gold but sacrificing progression at the start of the match? It’s hard to decide. In matches with multiple dragons, if you deal enough damage to villages without destroying them, they’ll become fearful of you. Once they reach this state, they will periodically bring carts of gold straight to your hoard. To keep them doing this, you’ll want to make sure no other dragon deals more damage to them, otherwise they will become fearful of the rival dragon instead of you! Thieves will also visit your hoard, attempting to get away with your hard-earned (or hard-stolen, I suppose) gold. If you can get back to your hoard in time, you can kill them before they make it away. Mage towers will periodically rise in the land, attacking you with magic. Destroying them causes a gem to appear worth a large amount of gold. Similar to villages, if you leave the mage towers alone, they’l grow more powerful but will drop more gold. Letting them live can be quite the gamble, however, because too many can prove too much to handle. Another fun way to make gold is to kidnap princesses. Once you return to your hoard with a princess, you’ll have to keep those pesky knights away for a preset amount of time in order to collect your ransom. You can only hold a set amount of gold before needing to return to your hoard to drop it off. You also replenish HP when at your hoard. Gold also acts as experience; when you collect enough gold, you gain a level and can increase your stats. You have four stats that can be raised – speed, fire-breath, carrying capacity, and armor. What you raise first can really change how you play at the start of the match, leaving this a great example of the complexity of strategy inherent in the game. Hoard features four different game modes. In the Treasure mode, which is the primary mode, you must collect the biggest hoard of gold to win. Princess Rush tasks you with kidnapping the most princesses. In Hoard (survival), HP doesn’t replenish. Instead, you’ll need to kidnap princesses to regain health while attempting to survive as long as possible. Finally, in Co-op you share a gold hoard with the other dragons! Hoard doesn’t have a campaign or story mode at all. 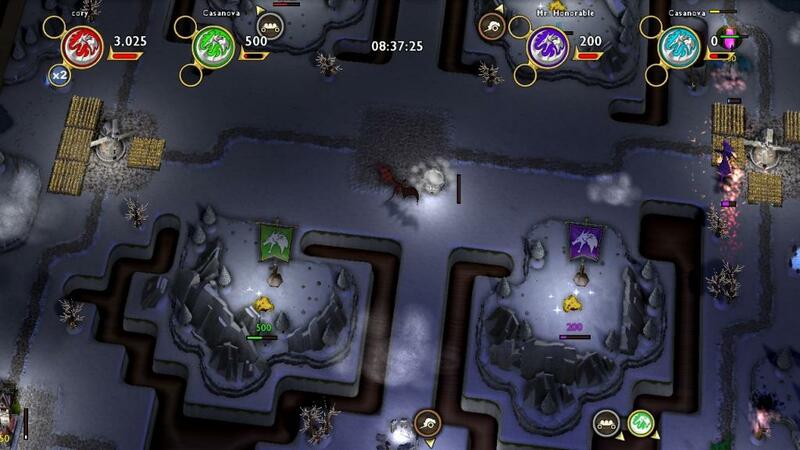 All the modes are played in short skirmishes either alone, with AI-controlled dragons, or multiplayer! Hoard is a fantastic game because of the complex strategies available that have been boiled down into 10 minute chunks of gaming. Multiplayer is a great way to spice it up, but AI dragons provide fun when no one’s aound with whom to play. While it lacks any kind of campaign mode that can give that “ahh, I’ve beat the game” moment and feeling, it’s great because you can play as many rounds as you feel like playing, and it’s always a bit different. Similar to how multiplayer, arena-based first-person shooters contrast story-driven first-person shooters, Hoard fulfills the same relationship with story-driven real-time strategies. Hoard is a complex RTS dressed up as a tabletop, miniatures wargame and served in small portions. It’s $10 on Steam and definitely worth the pricetag. This piece was originally published as a review on Game Boyz on 5/2/11. Each Game Boyz review is structured with sections for introduction, graphics, sound, gameplay, and conclusions. Games are scored on graphics, gameplay, sound, tilt, and overall, each on a 10-point scale. 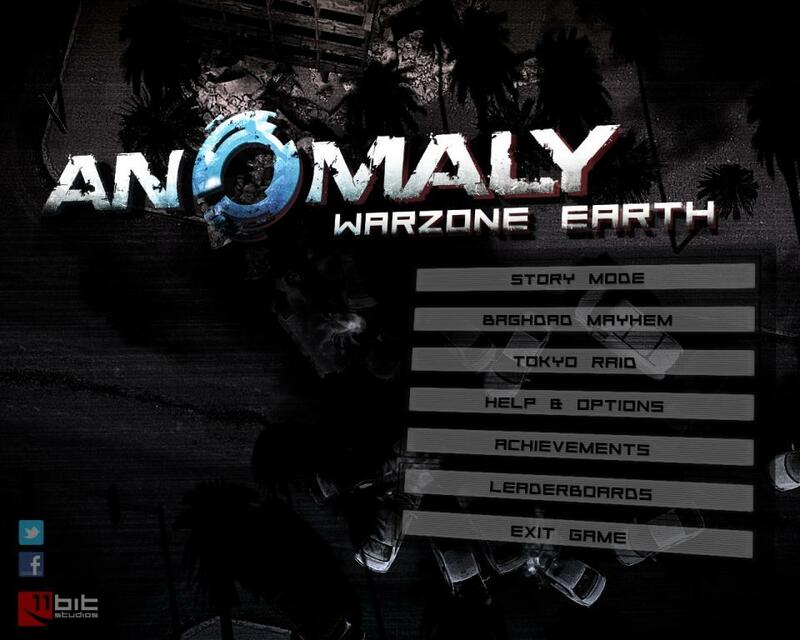 Anomaly: Warzone Earth was reviewed using a downloaded copy provided by 11 bit studios. I still find this game under-appreciated. 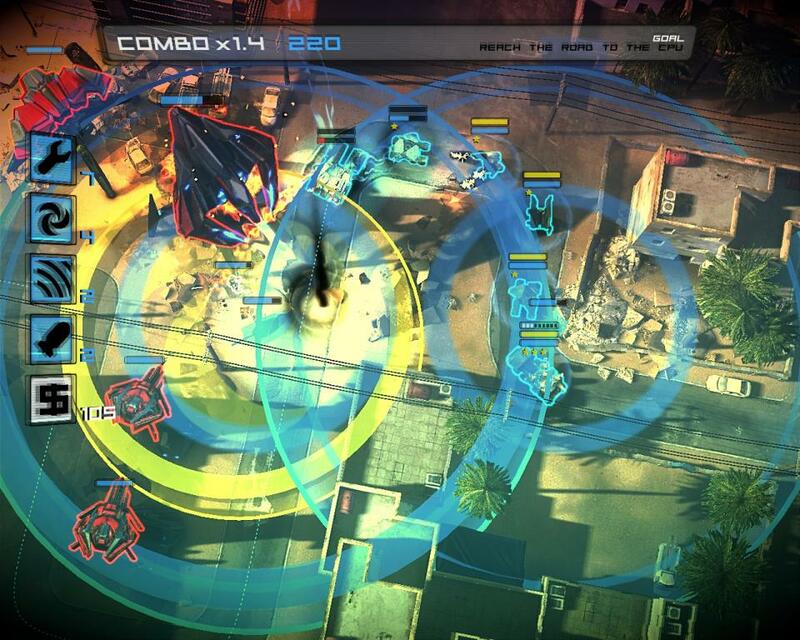 Anomaly: Warzone Earth is a fantastic new game available on Steam for both PC and Mac. Provided to me by 11 bit studios, Anomaly is a tower defense game… of sorts. Perhaps it’s better to call it a reverse tower defense or a tower offense game. Or better yet, we could just call it a strategy game! 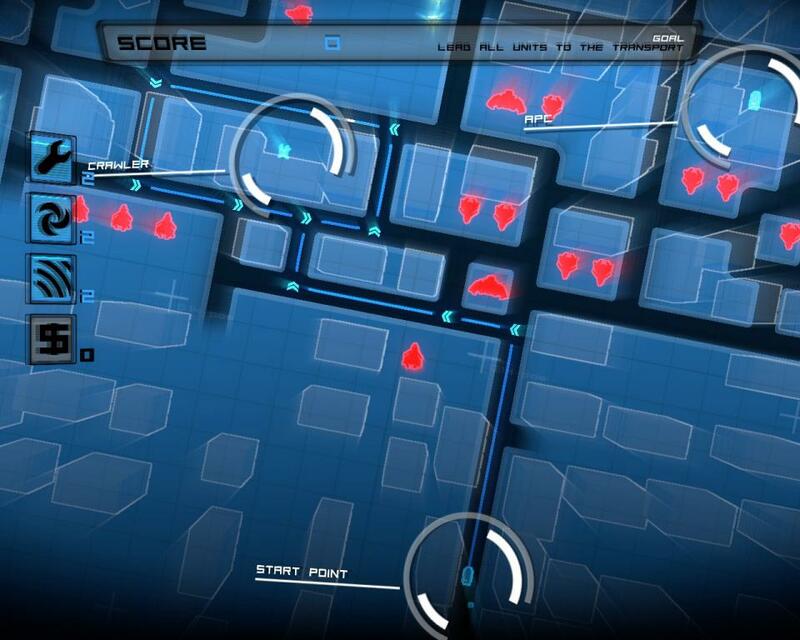 In Anomaly, you see the layout of turrets in the level while controlling a line of assault vehicles. You strategize by planning the best route, deciding which vehicles to use and upgrade, and using special abilities. 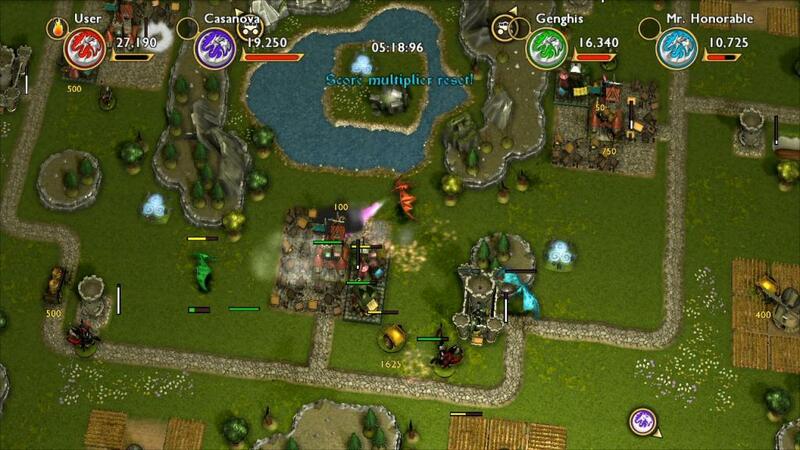 If you plan carefully, your units can destroy the turrets, get through the defense, and reach the end of the level! Anomaly looks great on my great on my PC. I’m running Windows 7 Professional on an Intel Core 2 Duo 64-bit 2.53 GHz processor with 6 GB RAM and an NVIDIA GeForce 7800 GT graphics card. Even with my less than stellar graphics card, the game ran fine on maximum video settings and looked fantastic. Everything looked clean and easy to see. Enemies are outlined in red and friendly units are outlined in blue. Simple health bars appear over units’ heads. 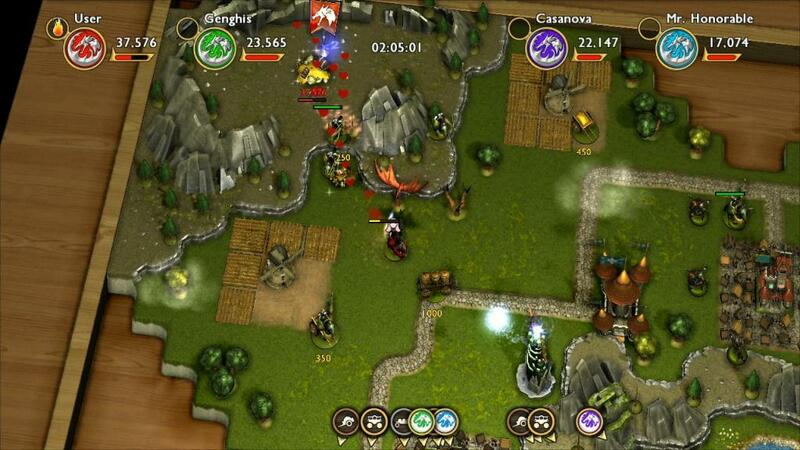 On the left side of the screen, icons representing various abilities are present with the amount available appearing adjacent to them. An elegant tactical map screen can be pulled up at any time, and the unit upgrade and purchase screen is also sleek looking and simple to use. In the main menu screens, small amounts of the screen were cut off from the edges of my non-widescreen monitor. I could manage to read everything, so it wasn’t a terrible error. It’s also a known bug that 11 bit studios is fixing. Like the graphics, the audio was also great, and I definitely don’t have any complaints. Both the music and sound effects were good. I enjoyed the dialogue quite a bit. Despite being a little cheesy, it was very fun. Sometimes holding the speed-up button, which speeds up the game for those stretches where you’re waiting for combat, caused dialogue to cut out. It was a minor annoyance, but I had to remember to stop holding the button if I was approaching a goal at which I expected dialogue. As I mentioned previously, Anomaly: Warzone Earth is a reverse tower-defense game. You control up to six vehicles and a commander. The vehicles travel along roads on set paths. Bringing up the tactical map pauses the game and allows you to control which direction the convoy will turn at each intersection. You can’t stop, reverse, or deviate from the path. 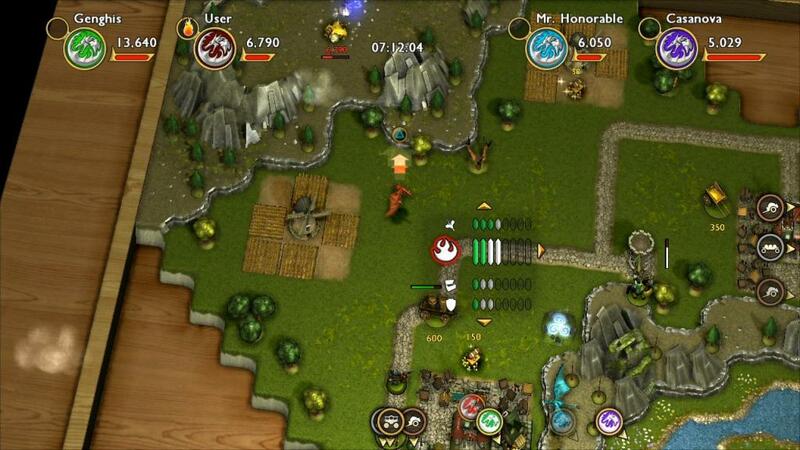 The map shows the entire level, any power ups available to be picked up, and all enemies as well as your own units. Because different enemies have different types of weapons and ranges, it becomes very important to plan your route carefully on the map screen. For example, some enemies can only shoot directly in front of them. You’ll want to drive past these turrets rather than down streets heading straight toward them. Another trick is loop around repeatedly, slowly picking off enemies. You’re awarded money for destroying enemies, and you can also find minerals that are worth money. You can then spend your earnings on new units (up to six) or on upgrading your current vehicles. Besides planning your route and upgrading, there’s another huge aspect to the strategy involved in Anomaly. Your commander doesn’t follow the set paths and can go anywhere. Unlike the vehicles, he deals no damage; rather, he deploys special abilities! You have a set number of each ability but can find more throughout the level with them usually appearing where some enemies were destroyed. When an ability is deployed, it lasts for a small amount of time. The first ability introduced is the Repair. Any friendly unit within the circle that appears is repaired as long as it’s within the circle. Next there’s the Smoke Screen, which lowers the accuracies of all enemies within the circle. Similar to the Smoke Screen, the Decoy will cause all enemies within the circle to target the decoy. (Using the Smoke Screen and the Decoy at the same time works quite well!) 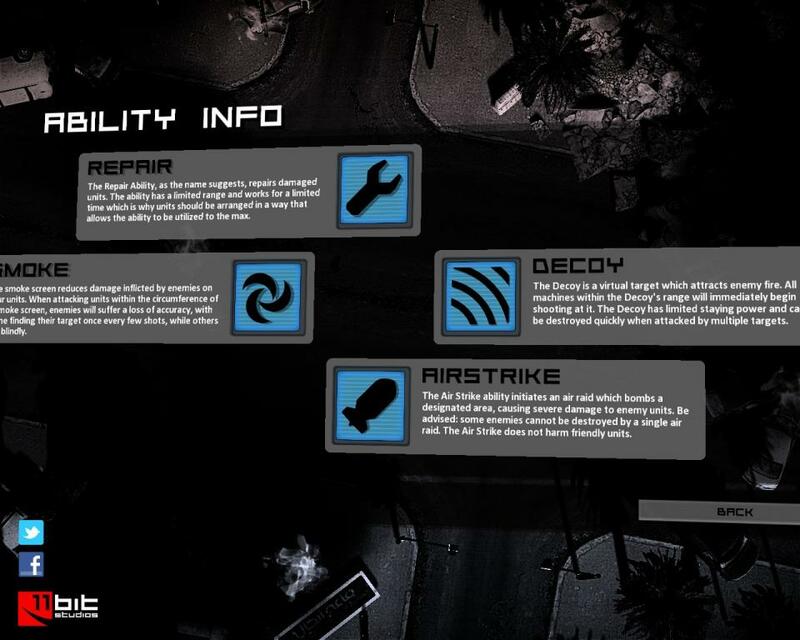 The final ability is the Airstrike, which drops a bomb on the current location. When the commander dies, he respawns at the same location after a short delay and is invulnerable for a couple seconds, letting you get back to safety. The strategy involved comes from a few different aspects. First, you’ll want to plan a good route. Most likely you’ll be bringing the map up repeatedly throughout each level, adjusting your path as you go. Next, you’ll want to plan which units to use and which order to put them in your convoy. For example, I like to start with a high-armor unit, and I include two shield generating units in my convoy. These shield units provide shields around themselves and the two adjacent vehicles. You’ll also want to correctly use your commander’s abilities to help your vehicles survive. Finally, you’ll need to upgrade your units wisely. There are three difficulties available with which to challenge yourself. You’re awarded points for destroying enemies (more for destroying them without too much delay between kills) and having abilities at the end of the level. Each level has its own leaderboard, providing a lot of competition. Let’s not forget the story! There is a reason for the vehicles to be fighting those turrets! An alien ship crashes in two spots on Earth, Baghdad and Tokyo. Strange domes, anomalies, appear over the crash sites, and appear to be some sort of shield. Inside these anomalies are the alien ships and turrets. After investigating, the military finds them quite aggressive and decide to neutralize the enemy. Before and during missions, characters talk, giving you some background on what’s happening. This is ample motivation to give a reason to the actions in the game and also provides some interesting twists along the way. 11 bit studios has made a fantastic game with Anomaly: Warzone Earth. It’s definitely a change to the tower defense genre. With a compelling story mode, achievements, leaderboards, and two assault modes, there’s plenty to do for people looking for high replay value. I find Anomaly: Warzone Earth incredibly cheap at $9.99 and worth every penny. If you’re interested in strategy games, I highly recommend you pick this one up and keep your eyes on 11 bit studios in the future! This piece was originally published as a review on Game Boyz on 2/23/11. Each Game Boyz review is structured with sections for introduction, graphics, sound, gameplay, and conclusions. Games are scored on graphics, gameplay, sound, tilt, and overall, each on a 10-point scale. Gemini Rue was reviewed using a downloaded copy provided by Wadjet Eye Games. 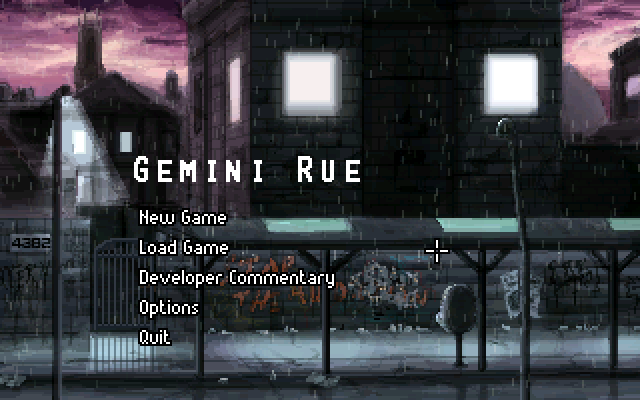 I loved Gemini Rue when I first played it, and it’s still one of my favorite games. Gemini Rue, formerly known as Boryokudan Rue, is a new PC game developed by Josh Nuernberger. Published and provided to me by Wadjet Eye Games and Dave Gilbert, Gemini Rue was a 2010 Independent Games Festival Student Showcase Winner. Nuernberger has created a wonderful point-and-click adventure game featuring a dark, sci-fi future. The game’s neo-noir narrative takes players through a grim future in which trust should be withheld and the Boryokudan crime syndicate controls the Gemini system. The story kept me at the edge of my seat through the entire game. In fact, not being able to talk about the game while playing my review copy was almost painful! Gemini Rue explores the themes of individuality, identity, ethics, loyalty, and what it means to truly be who you are. Gemini Rue is absolutely gorgeous. As you can see in the screenshots included in the review, it has a retro-inspired look to it that adventure game fans should recognize. While not 3D or pushing anyone’s graphics card to its limits, it’s a stunning game that will leave most appreciators of retro game art with their mouths hanging open. Gemini Rue lets you explore beautifully detailed backdrops while discovering the truth of the world around you. You’re given a closer look at the characters when their detailed portraits appear during dialogue. Throughout the game, small cutscenes play out that are fascinating to watch. Not only do they push the narrative forward, but they also set the mood using well-placed, beautiful scenic views. In a lot of games I play, there isn’t a lot to say about the sound. In this case, forgetting to talk about the sound would be leaving a large part of the review missing. The audio in Gemini Rue is amazing. The music always fits the action and story, reinforcing the desolate, dark atmosphere of the game. The sound effects are always clear and realistic, which helps the game feel more real and adds to the immersion. Voice-acting performances were done well. 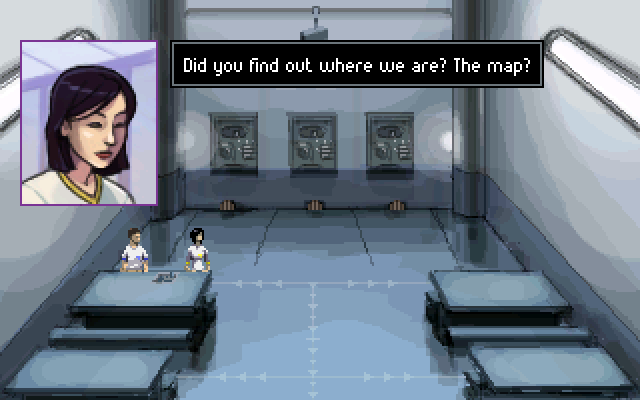 Even though Gemini Rue is an indie game, no corners were cut with the voice-acting. The lines are delivered in a natural way so they don’t feel forced. I could tell the sound was going to be great and a major part of my enjoyment of the game by the first scene during which the characters’ dialogue was delivered over the sound of Barracus’ rainfall. Gemini Rue has two main playable characters. One is Azriel Odin, a former assassin searching for an old friend in the Gemini system. The other is a man known simply as Delta-Six, a patient in a strange facility that wipes the minds of its inmates. The narrative switches between the two characters throughout the game. Sometimes this happens as preset times, but you can also manually switch characters. This can give you a nice break if you’re stuck with one character. The stories seem far apart from each other, but the characters’ stories slowly come together, culminating in a fantastic and satisfying ending. As the genre, point-and-click adventure, suggests, you use your mouse to control the game, clicking on various objects to explore the game. Left-clicking causes the character to walk to that point. Right-clicking on certain objects in the scene brings up the action menu, allowing you to choose which action to perform on that spot from the four action-verbs and inventory items in your possession. Clicking the eye allows you to examine something. The hand has you interact with or pick up an object. Using the mouth will have you talk to the target. Selecting the foot causes you to kick the object. The kicking action is interesting because I don’t recall seeing it any previous adventure games. While it’s similar to the hand action, it gives players a second way to interact with the world, which can lead to more involved puzzles. Gemini Rue forces you to use this action very early in the game, making sure you incorporate this less familiar action into your repertoire. Also in the action menu are any inventory items you have. Selecting one will attempt to use it on the spot you originally right-clicked. Right-clicking on an inventory item causes you to examine it. Lastly, double-clicking in the scene will use whichever action was last used, allowing you to save time if, for example, you want to examine many different objects. I have two small complaints about the control system. First, to examine an inventory item, you have to bring up the menu by right-clicking on a targetable object in the game. Note that you can’t simply right-click anywhere. It seems strange that even though examining an object in my inventory has nothing to do with any item currently in the scene, I still have to choose one object in the scene arbitrarily to right-click on to be able to access my inventory menu. Another small complaint is that interacting with an object on the other side of the screen will sometimes cause the character to walk over to it and interact with it while other times will cause the character to say it’s too far away. Why the discrepancy? It seems like saying it’s too far away would be the best response if there’s some puzzle blocking the path, so this might be a pathing bug. These faults are minor and do not detract very seriously from the enjoyment of the game. Gemini Rue also contains action sequences featuring shooting. It uses a fun system that rewards being patient and intelligent rather than having fast reflexes. It’s perfect for an adventure game and isn’t overused. Whenever a shooting sequence starts, your character will automatically get into a cover position. Using ‘a’ and ‘d’ causes the character to lean out of cover to the left or right. Pressing ‘space’ shoots, ‘s’ goes back into cover, ‘r’ reloads, and ‘w’ switches targets. Enemies will either shoot at your left or right out-of-cover positions. To successfully defeat enemies, you’ll want to lean out of cover on the opposite side of where your adversary is aiming to shoot at him. Pressing ‘control’ while out of cover will bring up a slowly filling meter. When the meter reaches a sufficient height, successfully shooting an opponent will instantly kill him with a headshot. This is a gamble because you’ll have to be out of cover for longer to wait for the meter to fill. 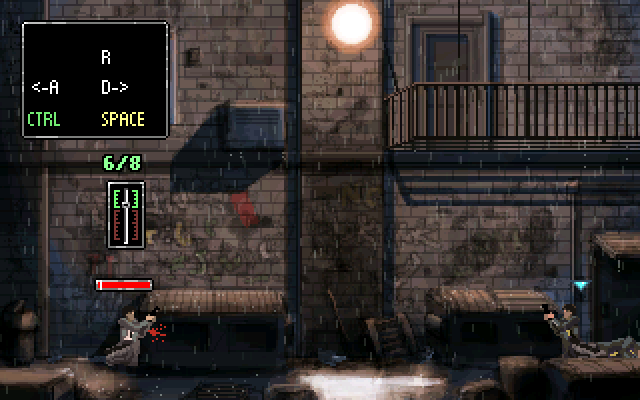 Some people might not like action sequences in their normally slow-paced adventure games, but the characters in Gemini Rue will always get into cover automatically at the start and won’t take damage while in cover. Because of this, the player never needs to worry about being caught unaware. Shooting adds a bit of variety to the game, and let’s be honest: How could this neo-noir thriller be complete without some gunfights? 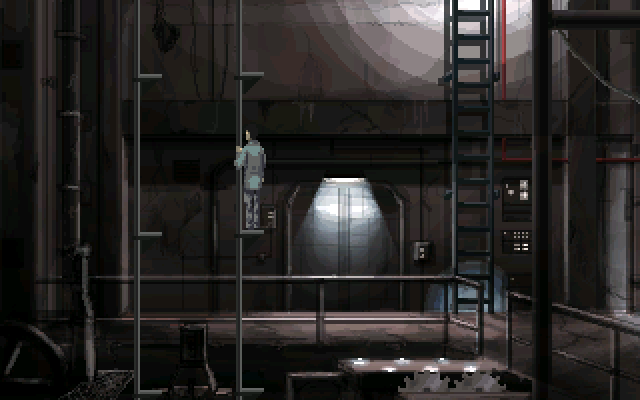 There are a few other scenes in the game that require gameplay other than normal point-and-click. Interacting with certain boxes allows you to push them around, ‘a’ and ‘d’ used to move them left and right, ‘w’ used to climb on top, and ‘s’ used to climb back down. Also, there are occasional puzzles regarding getting a computer or machine to do what you need it to do. These never distract from the story or take very long. They fit very well with the rest of Gemini Rue and, more importantly, would detract from the game if missing. One aspect of the game is interacting with the environment – finding items you need and figuring out where to use them. You’ll also need to gather information, sometimes from notes found lying around or computer terminals. You need to think about what you know and what you need to know to reach that satisfying moment where the puzzle suddenly clicks in your head. You’ll also need to get a lot of information from other characters in the game. Dialogues have multiple choices that can lead to the same positive result, giving players more than one way to solve a dialogue puzzle. The dialogue is fascinating and continually adds to the narrative. No character feels needless or like filler content. In fact, Nuernberger does a fantastic job of making sure every scene, character, and bit of dialogue exists for a reason and continues to progress the narrative and enjoyment of the game. Let’s get this out of the way: I love Gemini Rue. The narrative was gripping, friendly characters were likable, and supporting characters all seemed like they belonged in the world and evoked the correct emotional response. 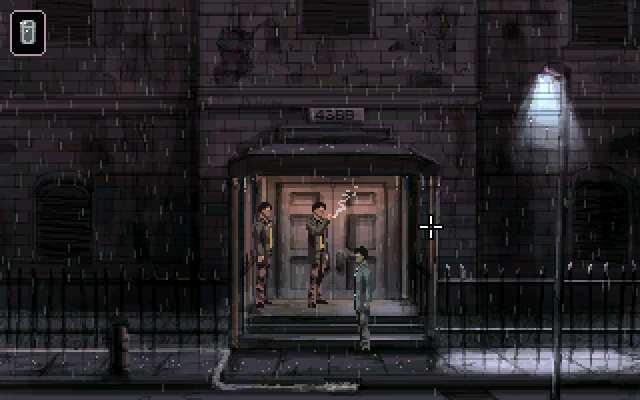 The dark, rain drenched neo-noir setting is perfect for the story being told. Scenes were beautiful, the music fit superbly, the voice-acting was believable, and the sound effects were realistic. Is a person simply the sum of all experiences and outside input or is there more to a person? Gemini Rue explores identity, ethics, and even free will. Like all great pieces of fiction, which Gemini Rue definitely is, it’ll leave you contemplating the questions it poses even if it doesn’t offer a concrete answer. Gemini Rue is available for purchase and download at WadjetEyeGames.com for $14.99, a very low price for what is now one of my favorite games. For those of you who are still unsure, there’s a demo available on that site as well. If you’re an adventure game fan or simply like the themes, setting, and story presented, you owe it to yourself to look into Gemini Rue! SQUIDS was one of the first games for iOS about which I was truly excited, looking forward to sequels. The Wii U version didn’t let me down. It’s available on the Wii U eShop for $14.99. Not only is it fun, but it’s also very beautiful. While I’ve played the iOS games before, it was still great to jump back into the ocean-world of SQUIDS on my Wii U. This time I had the opportunity to let people watch me easily, which isn’t something I could do on my iPhone. I’d definitely recommend SQUIDS Odyssey to strategy fans who like light-hearted fun and will be waiting to see what The Game Bakers do with the series next. via SQUIDS Odyssey for Wii U | iPhone/iPod, Wii U, Nintendo DS , DSI, Reviews, Strategy. I have a new review of SQUIDS Odyssey up at Game Boyz. It’s my first console game review for the site actually. A couple weeks ago I reviewed The String Arcade for Game Boyz. The String Arcade is an album of music arranged for string quartet all based on songs from video games. It’s pretty cool, so I thought I’d share a link to my review here. Creating a new variation on some classic video game music, the recently release album, The String Arcade, reimagines fifteen video game songs (seventeen if you buy the physical CD) arranged for string quartet. The album was arranged by Dren McDonald and Jason Poss. The proceeds go to the Alameda Music Project, an after-school music program starting in September that features strings, chorus, and percussion for children in grades K-5. You can read more about The String Arcade on their website at TheStringArcade.com where you can also find links to purchase the album. The digital download is $9.99, and the CD is $11.99, which comes with the two bonus tracks – Tron Arcade Medley and Altered Beast Title Theme. Now I find myself wondering how I can find more string quartet music, because I loved The String Arcade. Any suggestions? via The String Arcade, game music for string quartet | Reviews, Rhythm.